Lexus introduced the first luxury crossover back in 1998 with the RX300. From that time Lexus has sold more than one million RX models making it the most successful luxury utility ever. The all-new 2010 RX350 once again raises the bar for design, engineering and luxury innovation in the segment by refining, retuning and adding the latest in automotive high technology. 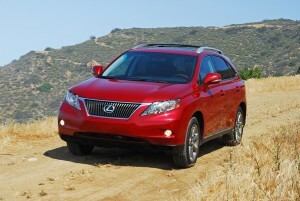 The 2010 Lexus RX350 teams a revised 3.5 liter V6 engine with an all-new six-speed Multi-Mode automatic transmission. New intake and exhaust manifolds improve engine breathing for enhanced performance and fuel economy. Horsepower is increase to 275 at 6,200rpm from 270hp, while Lexus maximized the torque output to better meet the needs of luxury crossover owners. Ninety-percent or more of the 256lb.ft. of peak torque is now available from 2,300 to 6,100rpm, an optimal range where torque is most utilized. A new insulated engine cover, styled in the shape of two cylinder banks, conceals the new V6 to help ensure a quieter cabin, while easy-access points facilitate routine service such as adding oil. Dual Variable Valve Time with intelligence (VVT-i) is used to control both intake and exhaust camshafts independently, optimizing engine performance at all speeds and loads. Refinements to the valvetrain, including roller rocker arms and slimmer valve stems, reducing friction and weight to improve fuel economy. Also helping to enhance torque is the improved Acoustic Control Induction System (ACIS), which varies the intake runner length in response to engine speed and throttle position. The ETCS-i (electronic throttle control system-intelligent) softens throttle response during initial acceleration for smoother takeoff and to help reduce wheel spin. 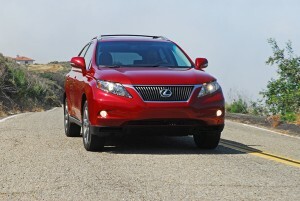 The 2010 RX350’s new six-speed automatic transmission replaces the previous five-speed. Using miniature high-flow linear solenoids to control transmission-fluid line-pressure, the transmission yields quicker shifting response. The torque converter uses a new low-speed lockup damper to enable lock-up from second to six gear to help improve the fuel economy. When applying the accelerator pedal rapidly during kick-down, the new direct-downshift control allows the transmission to directly shift from sixth to third or fifth to second, skipping the intermediate gears to achieve the quickest response. Under normal kick-down pedal application, downshift control uses the intermediate gears to ensure the smoothest shift is attained. ‘Shift shock’, which was already commendably low in the previous model’s five-speed automatic, is further reduced. The Multi-Mode automatic allows you to shift manually when desired by first moving the gated shift lever to the ‘S’ slot and then pushing it forward (+) to up shift and backward (-) to downshift. An Artificial Intelligence shifting (AI-SHIFT) control, new to RX, sets shift patterns based on the vehicle speed and throttle position and estimates road conditions and driver input to automatically control the shift pattern. For example, when driving in hilly areas, AI-SHIFT can prevent unnecessary shifting. When descending inclines, the transmission prevents up shifts to achieve more engine braking. The refined engine and new transmission work seamlessly to give you a ride that is pure enjoyment. No noise, vibration or harshness when driving at moderate speeds taking care of business around town or when cruising on the highway at high speeds. 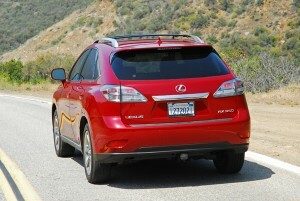 Lexus again offers its RX350 models with a choice between front-wheel-drive and all-wheel drive. The 2010 RX350 introduces an all-new electronically controlled Active Torque Control AWD system. The previous RX350 model’s AWD system used a viscous coupling locking center differential to provide 50:50 torque distribution. In the 2010 RX350, Active Torque Control AWD uses an electronically controlled coupling ahead of the rear differential to vary torque distribution anywhere from 100:0 to 50:50 front to rear, depending on driving dynamics and road conditions. The new AWD system is 35lbs. lighter than before and reduces parasitic losses by 30%. When accelerating, or starting off on a low-grip surface, torque is quickly provided to all four wheels. At steady speeds, torque is sent only to the front wheels, enhancing fuel efficiency. For handling agility and control, the AWD system increases rear-wheel torque when the vehicle’s front tires start to lose traction and decreases rear-wheel torque when the vehicle’s rear tires start to lose traction. On rough or sandy terrain, an AWD LOCK switch provides enhanced traction performance for low-speed maneuvering (if in LOCK mode, the system reverts to AUTO mode when your speed exceeds 25mph). To help prevent a tight corner-braking condition (shuddering) during low-speed cornering, the system reduces rear wheel torque. Lexus engineered the 3rd generation RX luxury utility vehicle to provide a more engaging driving experience while also making it quieter and smoother than its predecessor. The overall packaging of the new RX remains similar to that of the previous model. The new RX has a marginally longer wheelbase (+0.79in.) and is 1.38in. longer; the new model is slightly higher and 1.6in. wider than before. To help provide greater handling control, the track is 2.8in. wider. The engine’s output center has been lowered approximately 0.6in., yielding a lower overall powertrain center of gravity to help enhance vehicle agility. A key factory in the RX model’s sharpened handling agility is the all-new uniquely designed double-wishbone rear suspension, which replaces a strut-based configuration. 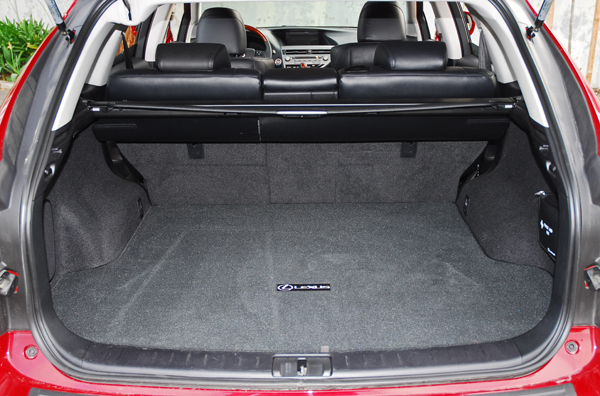 Another key benefit of the new rear suspension is that the packaging yields greater rear cargo room. Despite larger tires and a longer wheelbase, the new RX retains the 38.8ft. turning circle as before. The front suspension geometry was optimized for the new platform and features a new, thicker stabilizer bar, and retuned MacPherson gas-charged struts. New inversely wound front coil springs compress in opposite directions, preventing the negative effects of suspension compression on steering. Speaking about guiding you on your chosen path, the new standard electric power-assisted rack & pinion steering system contributes to improved agility and steering feel while eliminating the parasitic losses of a hydraulic steering pump. When the driving conditions involve little steering effort, like cruising down a highway straightaway, energy consumption is reduced, improving fuel economy by nearly 3%. Steering assist is automatically adjusted in response to vehicle speed, with greater assist at low speeds and great feel at higher speeds. The system is boosted just right for that luxury ride feel. 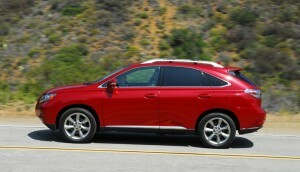 The brakes on the new RX350 are enhanced for 2010 with a new two-piston front caliper and larger rotors up front, 12.9in. vented, and 12.2in. solid in the rear. Brake feel is enhanced by optimizing pads, pedal ratio and booster output characteristics. When you push the brake pedal down the feel is very linear and further enhancing braking is standard ABS and Brake Assist. The new RX350 rides on new, wider 18X8in. aluminum alloy wheels that are wrapped with 235/60R18in. all-season tires. Optional 19X8in. aluminum alloy wheels come wrapped with 235/55R19in. all-season tires. While the powertrain has been refined and the suspension system re-tuned for a smoother and more controlled driving experience, the new exterior styling gives the RX350 a more substantial and shaper look. It is a blend of a dynamic new version of L-finesse design while retaining the RX identity. The sleek profile is accentuated by broader ‘shoulders’ for a more athletic yet elegant presence. Bright finish side-window moldings follow a subtly concaved line across the A-pillars and C-pillars, extending at the front and rear ends. A thick chrome strip runs under the door bottom, and the arrowhead point of the rear window gives the look of motion. The Lexus design cue of placing the grille lower than the headlamps, along with sharper headlight graphics, yields a strong frontal expression. 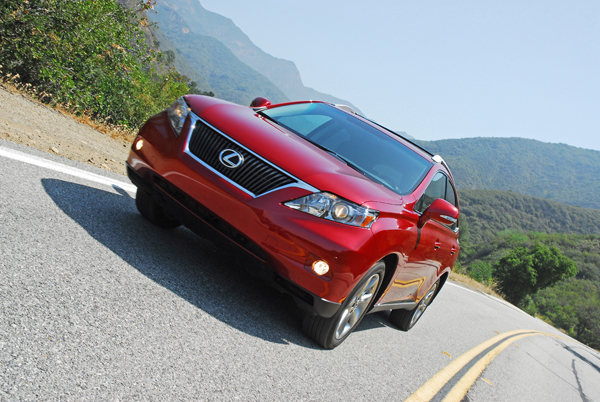 The RX350 offers standard halogen and optional HID headlights. The plated upper edges of the front grille extend toward the headlights to draw the front features together. The lower edges of the grille form another unique arrowhead design. Subtle surface movement can be seen in the sculpted vertical bars that change shape as they spread forward. Pronounced front fenders flow into the doors, and integrated rear fender flares neatly sweep around to pull together the taut rear corners. The lower body emphasizes the standard 18in. wheels. A contrasting black strip runs completely around the body of the new RX350. A distinctive feature of the door handles is that the surface subtly twists outward from the front to the rear to give a comfortable grip. The power-remote/heated side mirrors feature LED turn signal lamps. The rear features new, larger, wraparound lamp cluster with LED bulbs, and the rear hatch is formed larger and shaper to help with loading and unloading cargo. The rear spoiler’s primary function is to help lower the RX’s coefficient of drag and also to conceal the rear wiper and houses the AM-FM antenna and high-mount stop lamp. The all-new RX350 has grown substantially in length and width that adds to handling prowess and more room for passengers and cargo. Based on Lexus L-finesse philosophy, the dramatically designed interior clearly separates the interior into two distinct zones-the ‘display zone’ to provide information, and the ‘operation zone’ for interaction with controls. The shoulder of the door trim comfortably envelops you and your fellow passengers, the clear line of the trim beginning inside the cabin and tapering outward toward the exterior. The design imbues a feeling of a continuous line encircling the occupants and defining the controls and displays. Neatly sculpted metallic surfaces, especially on the asymmetrical center stack, showcases a bold contrast of shadow and light. 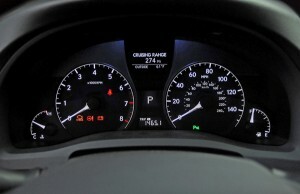 A new, higher contrast while Organic Light Emitting Diode is used for the multi-information display located next to the speedometer. Vibrant white characters are sharply displayed on a high-contrast black background for ease of use and a luxurious appearance. In addition to an Eco Driving indicator light, when in D (Drive), the RX350 features a new Eco driving indicator zone that displays current fuel economy using a bar graph and alerts you when you are achieving low fuel efficiency. Lexus employed extensive human-machine interface (HMI) studies to enhance occupant’s interaction with all controls. To help reduce driver distraction and effort, each HMI function in the new RX wastes no movement. The available eight-inch navigation display (or seven-inch audio/HVAC display when navigation is not ordered) is placed at a higher, more distant position, providing a more natural visual angle that is also shaded from the sometimes harsh sunlight coming in. Three innovations to come from the HMI studies include the multi-information switch on the steering wheel, the new Remote Touch console-mounted navigation controller and the available ‘Head’s-Up Display. The multi-information switch allows you to access numerous function settings with out taking hands off the steering wheel. It also reduced the number of individual switches, contributing to a cleaner instrument panel. Vehicle settings can be customized according to personal preference, including personal door-lock, interior/exterior light adjustments, driver’s seat easy exit, and window-closure setting preferences. The new available navigation system on the RX350 can be controlled using either the Remote Touch device or by utilizing voice command. The Remote Touch allows you to operate the navigation system, climate, audio, phone controls and more. The screen menus are selected with the controller, eliminating the need to reach out or avert eyes from the road. Once I understood the way the system worked it was no problem changing the climate setting or audio selections. This was also made possible with this unique controller with its ‘haptic’-feedback technology, which provides a tactile response to your hand. As you use the controller near a screen icon, the curser (arrow) is pulled to that icon with feedback from a servomotor in the device enabling you to feel it ‘click’ into place. You or your passenger make a selection by pressing the side thumb button on either side, and the feedback servo is adjustable for sensitivity. The system then confirms the action with a subtle sound. Remote Touch integrates the functions of seven hard switches used with the previous touch screen, helping you to operate those functions with minimal effort and distraction. I liked the system more than the large, round controller knob found in the BMW, Audi and Mercedes-Benz models. 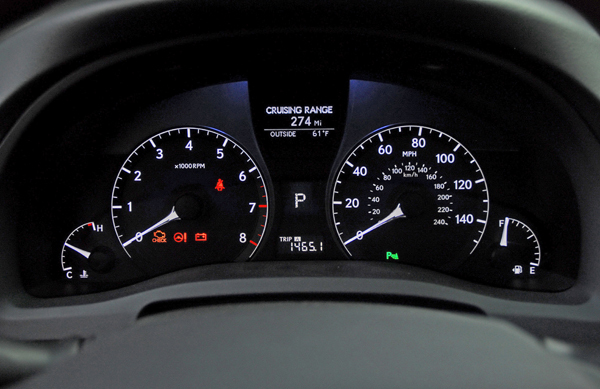 The all-new RX350 is now available with a Heads-Up Display (HUD) utilizing white readouts. High-intensity LEDs project high-contrast white figures onto the windshield, which are easier to read-and easier on the eyes-than the typical green-colored readouts. The HUD offers displays for speed, navigation, and audio. A wedge-shaped windshield interlayer for the HUD projection area eliminates the distracting printed grid pattern seen on some other vehicle HUDs. Luxury and attention to detail are a Lexus hallmark and the new RX350 is no exception. All RX models are equipped with the SmartAccess keyless entry with push button start/stop. As you approach the RX, interior and exterior courtesy lamps illuminate. Opening the door is by pulling out the door handle and the door magically opens, the instrument panel lighting gradually fades in. When the engine is started, the instrument gauge needles and marking illuminate, followed by the multi-information display. After you exit your RX, the lights fade out at different intervals. 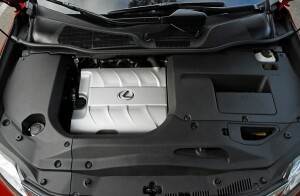 All 2010 RX350’s are equipped with power tilt and telescoping steering columns. To ease entry and exit, the seat automatically slides two inches rearward and the steering wheel tilts upward and slides forward when the engine is switched off. Upon pushing the ‘ON’ button, the seat and steering wheel return to positions pre-set by you using the three-position memory system. The newly designed, standard 10-way power front seats are shaped to accommodate arm movement when operating the available Remote Touch, while also holding you and you passengers in place. Both front seats are feature power lumbar adjustment. Also newly available on the RX is a ventilation function for the front seats to help improve comfort on hot and humid days. The shape and texture of the armrests and switches offer an ideal combination of tactile feel and functionality. The leather-wrapped three-spoke steering wheel features integrated audio controls and a unique cross-section that is designed to provide a more natural grip than a conventional round-section wheel. A leather and wood trimmed wheel is also available for added luxury. 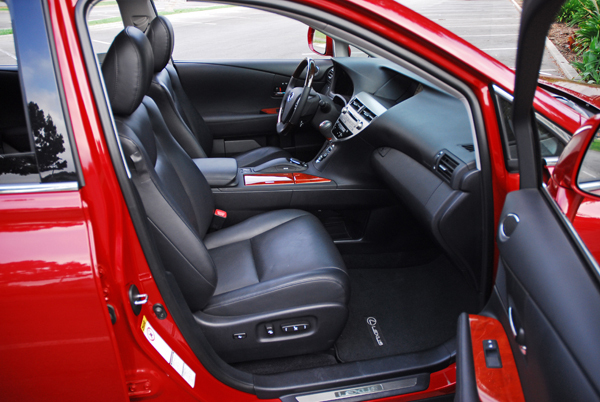 Three seat materials include standard fabric, optional smooth leather or even softer semi-aniline leather. Standard wood trim comes in Brown Walnut matched to Parchment, or Expresso Bird’s-eye Maple matched to gray and black. The center console box provides enough space to comfortably store CDs/DVDs or your owner’s manual. Even with the owner’s manual, the console box still offers more than 0.75cu.ft. of storage capacity. 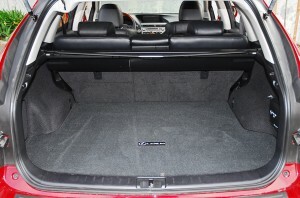 The three-part (40/20/40) rear seats can be slid and reclined, and can be folded down using the one-touch levers mounted in the luggage compartment. 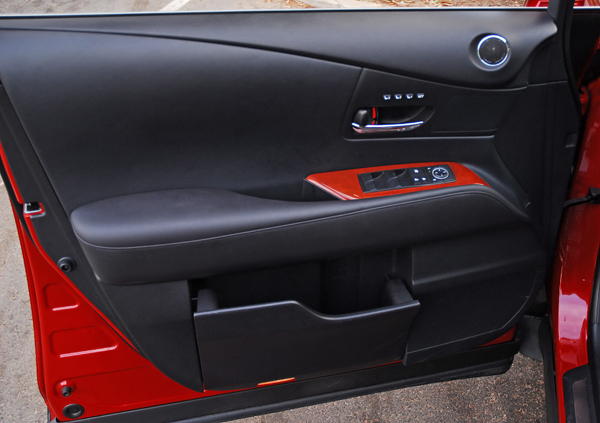 Compact rear-seat headrests help improve your rear visibility. The new double-wishbone rear suspension, due to its compact packaging, yield a larger luggage compartment; the width between the suspension towers is increased by nearly six inches. The new climate-control system offers quicker cooling and warming and is also quieter. A new high-efficiency compressor detects refrigerant flow in order to optimize engine control and fuel economy. The new system can cool the cabin to about two degrees lower and warm it by about five degrees higher than before. An available smog sensor is designed to detect harmful particles (CO, HC, NOx) in other vehicle’s exhaust emissions and automatically switch between fresh air and recirculation modes. The new Lexus RX accommodates a variety of music sources, providing auxiliary and USB inputs, Bluetooth Audio wireless connectivity and standard XM satellite radio capability, which is also joined by XM NavTraffic and XM NavWeather. Standard voice recognition and Bluetooth technology allow phone calls to be made and received while driving. When an iPod is attached via the USB port, information such as names for the artist, track and album is displayed on the available navigation or audio screen. The large center console storage box easily accommodates a variety of electronic devices while keeping wires out of sight. The RX continues the tradition of offering the Lexus Premium Audio system as standard equipment, in this case a powerful nine-speaker system with a six-disc changer. Creative placement and angling of the speakers perfectly cross-channels sound to the occupant on the opposite side of the vehicle to transform the cabin into a clear, crisp acoustic environment. A 12-speaker system comes with the optional navigation or rear seat entertainment systems and includes two-rear door tweeters and a compact L-shaped subwoofer in the rear luggage compartment. The optional 15-speaker Mark Levinson Surround Sound system allows listeners to enjoy 7.1 channel surround sound. The system, a Lexus exclusive, features a center channel coaxial speaker, metal-cone midrange speakers, tweeters and a 100-watt amplified subwoofer. A 2.5in. speaker built into each D-pillar provides the right and left surround-sound channels. The diffusion of sound provides each occupant the same level of audio quality. The available Hard Disc Drive (HDD) navigation system eliminates the need for DVD map discs and offers a unique voice recognition system, which can work using casual-language inputs on certain functions. An optional rear-seat entertainment system includes two high-definition seven-inch screens, one on each of the front seatbacks. Each screen can display video from separate sources. A remote control allows independent control of each screen. 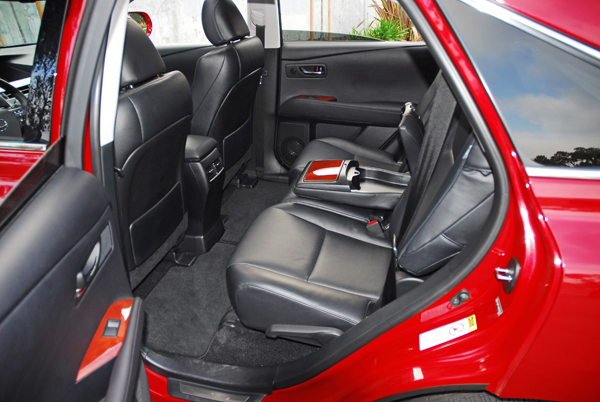 Rear seat occupants can also choose to listen to audio through the wireless headphones instead of vehicle speakers. The available wide-view side monitor and backup monitor each help provide you with a wider range of visibility. You can check hard-to-view areas by simply pressing the camera-select button on the steering wheel or, when in reverse, viewing the camera images on the navigation screen. An optional back up camera displays images on the eight-inch navigation screen; systems without navigation have a 2.4 in. display in the rear-view mirror. Standard equipment not mentioned above includes Lexus privacy glass, front fog lamps, sound insulation placed in door panels, instrument panel and floor mats, acoustic glass windshield, variable intermittent windshield wipers, auto on/off headlamps, thick cut pile carpeting, fabric roof lining, coat hooks, rear armrest with dual cup-holders, auto-retracting split tonneau cover for rear cargo area synchronized to retract with opening rear door, automatic dual-zone climate control, rear A/C vents mounted on rear of center console, illuminated LED glove box, center console box, front cup-holders, two 12-volt outlets, power windows with one touch up/down, power door locks, grab handles above each door, front seatback pockets, tool kit, first aid kit, vehicle stability control, traction control, rear stabilizer brace, optional towing package. Options not mentioned above include an electric moonroof and power-liftgate. Standard safety features include driver/front passenger airbags, front seat-mounted side airbags, roll-sensing front and rear side-curtain airbags, driver/front passenger knee airbags, active headrests for front seats, high-strength sheet steel components, side-impact protection, front/rear crush zones, force-limiting seatbelt pretensioners up front, and three-point seatbelts with pretensioners for all rear seating positions. 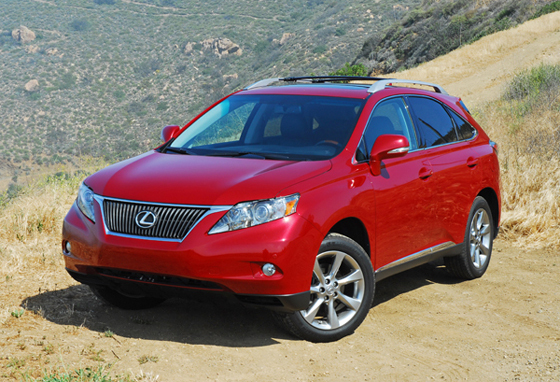 The all-new 2010 Lexus RX350 begins where the RX330 left off, offering more power, performance, stellar styling, an larger, more comfortable, luxurious, convenient, high-tech interior that matches any other mid-size luxury crossover on the market. The all-new RX350 should have no trouble maintaining its edge over the competition. Automatic: 345.6 mi. / 460.8 mi. / 384 mi.